Assalamualaikum wbt semua. Hari ni masuk hari ke 5 berpuasa. Sekejap je rasa kan. Nanti dah nak raya lagi 3 minggu. Whaaat? Haha. Baju raya pun tak beli lagi. Untuk Marissa je dah ada. Tahun ni tema warna ikut baju Marissa so nanti mak ayah dia nak kena cari 3 jenis color baju. Fuhh! Haha. So, saja nak cerita pengalaman cucuk vaksin untuk Marissa. 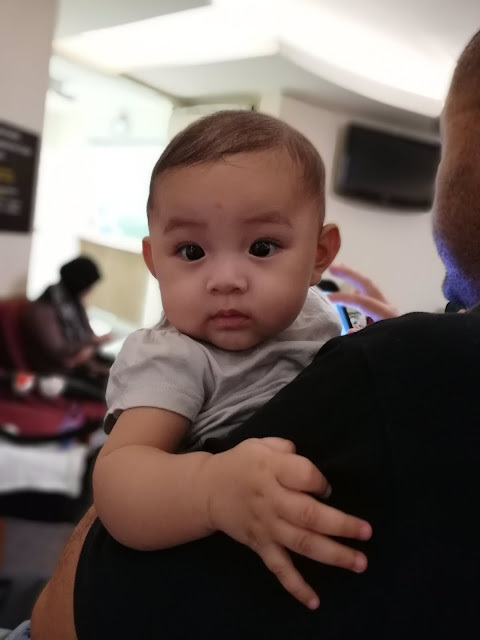 Since she's now 5 months old, last week we went for her third and final vaccination for DTaP/IPV/HIB/ Hep B/7vPCV and Rotavirus. So since we had a bit of a drama during her second vaccination, kali ni lepas je cucuk memang bagi PCM terus so that in a hope tak kena demam. A lot of my friends told me to do this so, this time around i did it. Alhamdulillah, tak ada demam so far walaupun badan a bit suam. Marissa has been coughing since 5 days before her vaccination. It started with a dry cough and then suddenly jadi wet cough. I was super concern bila dah ada phlegm cause i have a history of asthma and bronchitis. I do not want my child to suffer the same thing as mine. Salbutamol medicine was said is used to treat asthma and bronchiolitis but oral salbutamol was said to be not as effective as the nebulization salbutamol. Well, google said it so i am not sure weather to trust that or not. Apart from Salbutamol, i also applied garlic balm and Vicks for babies on her chest and tapak kaki. I can see a bit of a progress after applying vicks on her toes and cover up with socks. Will continue to do that for sure. Actually, i tak sanggup nak bawa anak pergi sedut kahak but if that is the last thing to do, then i might as well do it. But now, i am monitoring her cough and phlegm. It is said (Google said it) that a cough can lasts up to 7-10 days. Ni dah macam nak dekat 10 days dah. Minta Marissa cepat sembuh.